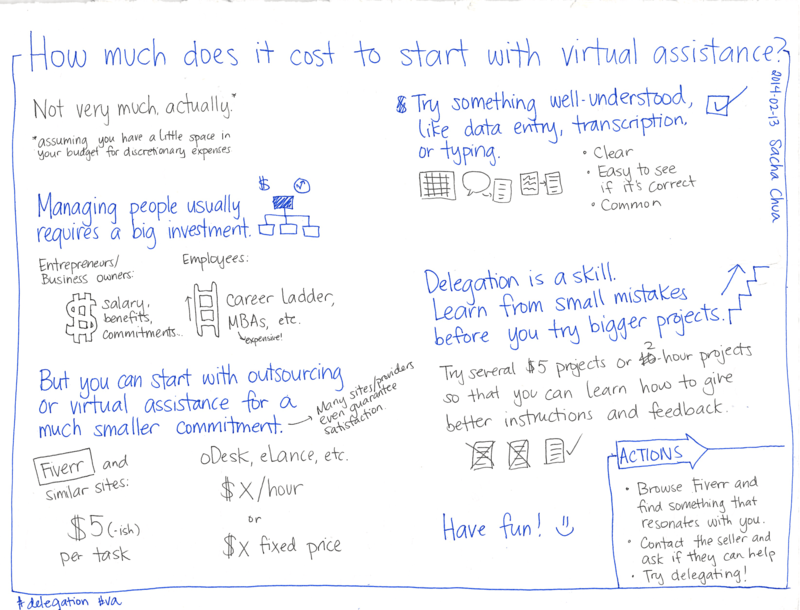 If you’re not used to delegation, hiring a virtual assistant can be daunting. It’s a concept that’s hard to grasp. 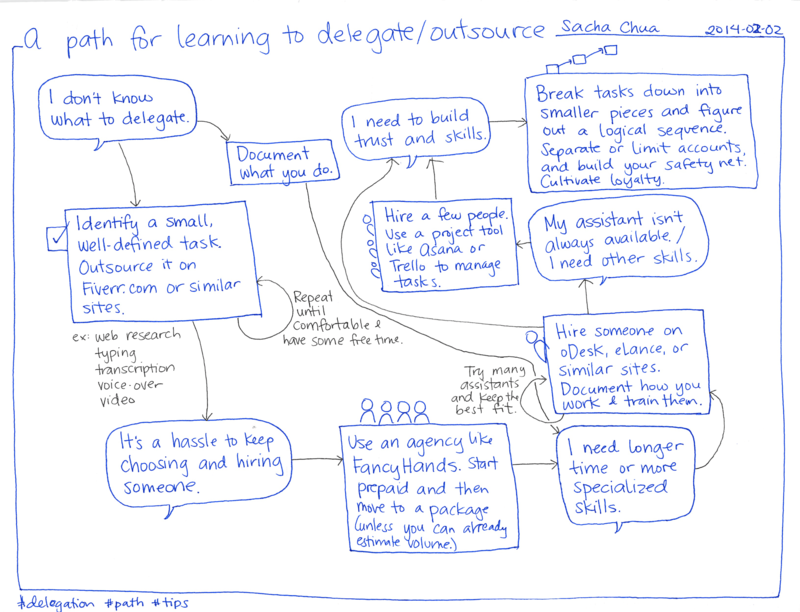 How can I outsource my tasks? What kind of assistant should I hire? Where can I set up my virtual workplace? And this big question: Does it cost a lot to get started? 1. It takes less money than you think. 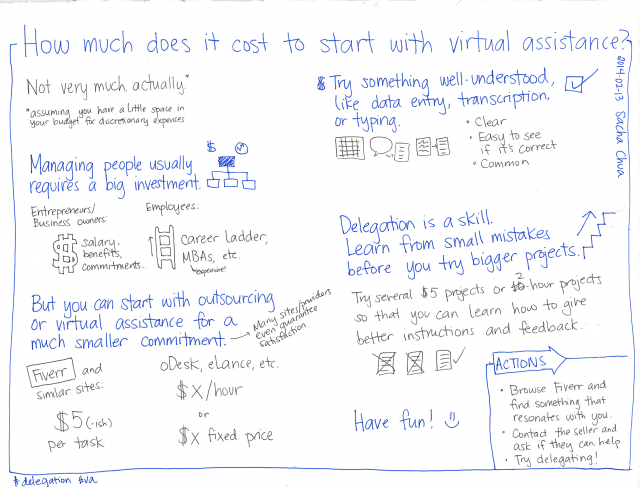 Hiring a virtual assistant will cost you money, but it’s not as expensive as you think. How can hiring another living, breathing, employee to do tasks that you could have done yourself be cheaper? Let’s look at an economic concept called comparative advantage. Comparative advantage refers to any entity’s ability to produce services or goods at a much lower cost. Imagine that you’re a blogger with several hours of interviews to transcribe. Yes, you may be a fast typist. Still, this task can eat up a lot of your precious time. You could spend that time writing or consulting instead. Hire an assistant. Even if he or she works slower than you, it can mean that you’ll be able to focus on tasks that have more value to you. Besides, with the right tools and a lot of experience, your assistant might even be faster. If you want more supervision, you can hire your own assistant through a marketplace like oDesk. These sites have work trackers where you can check on your assistants’ progress. Whether you’re looking for the best skills or the best rates, you can work with people from all over the world. I outsource the most through oDesk. I like the management tools there, and I’m happy with the people I’ve found. There are many places to find freelancers, so look around. 2. It takes less training than you think. You don’t have to spend hours on training. Most of the people that you’ll find on Fiverr or oDesk are already experienced freelancers. Just think about it – would they succeed selling their services if they weren’t? Start with something simple, such as transcription and data entry. These kinds of tasks are pretty straightforward and simple enough to do with minimal instruction. Make sure that your instructions are clear and easy to follow. You don’t have to write detailed training manuals, either. You might start by demonstrating a task, and then have your assistant document the process along the way. 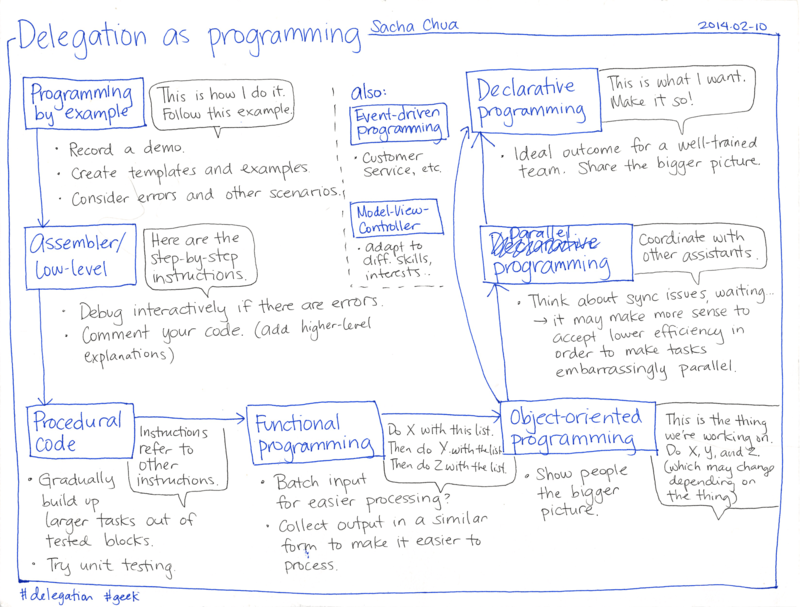 If you want to get a head start, check out my process library and my delegation board for examples. I’d love to hear what you do with this! 3. It takes less risk than you think. Trust takes time to develop. I can understand why you might hesitate at the idea of hiring an unseen assistant (a complete stranger!) to do work for you. No matter how small the task may be, it’s still your money and your time at stake here. Goodness knows I’ve had some interviewees and even virtual team members who gave me the heebie-jeebies. You can limit your risk by starting with tasks that don’t require a lot of access, and you can share more as you get to know your team. Many job marketplaces have safety systems and guarantees. For example, on Fiverr, you can dispute orders or get a credit refund if it doesn’t work out. One time, I paid for a Fiverr gig for transcription, and then the provider stopped communicating. Since the transcript was very late, Fiverr reminded me that I could cancel the order, and I did. oDesk gives you tools to resolve issues too. I hired a web developer and it turned out that he didn’t have the skills I needed. Because he was one of the contractors covered by the new oDesk guarantee, it was easy to get a refund. Delegation is something you learn through constant practice. Like anything else, you’re going to make mistakes along the way. Protect yourself from big mistakes and learn from small ones. It’s all part of the learning process. Start small. 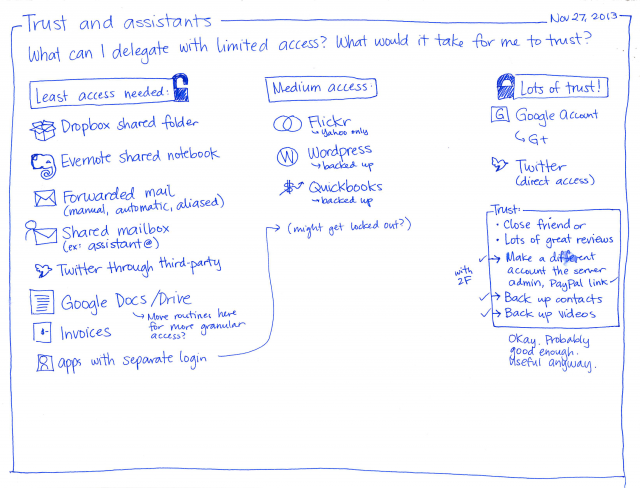 Let your virtual assistants work with small tasks first before trying bigger ones. If worrying about the cost was getting in your way, I hope this helps you get started! I wrote this post with a little help from Marie Alexis Miravite, who spent maybe 2 hours on this. (See the task in Trello.) I spent half an hour editing it and adding more stories, sketches, and links. =) What do you think?